Filter by Thruster Propeller Qty. Shopping for bow or stern thrusters can be intimidating. 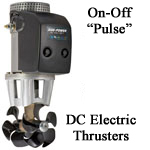 At SailorSams we make it easy to shop for the perfect thruster for your boat. First of all, bow and stern thrusters are the same thing until they're installed. When it's on the bow it's a bow thruster. When it's installed on the stern it's a stern thruster. There are two main categories of thrust control units: standard On-Off "pulse" systems and Proportional Speed Control "Pro" systems. Each form of propulsion control can come in Ignition Protected "IP" models or standard, unsealed models. Standard On-Off (pulse or feather) thruster units are either ON or OFF. There is no control of desired output and it is up to the operator to control vessel position with appropriate feathering of the thruster. 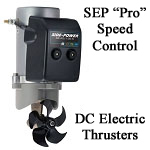 Proportional Speed Control (SEP or "Pro") thrusters can operate at lowered amperage, therefore they are able to have their power output controlled. This means you can control whether you deliver a small, medium or large "push" at short or long intervals. SEP units provide complete control of the duration and power of the thruster units output. 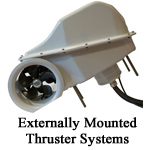 There are many thruster models available on the market. 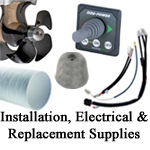 At SailorSams we offer Onboard Tunnel, External Drive and Retractable External Drive thruster systems.